Completely portable all-yard play! Play on the lawn, dirt area, sand or across an above ground swimming pool. (Each game stand needs a minimum deck area of 18"x21") 8' tall non-corrosive PVC poles with polyform bases to fill with water or sand. Deluxe net measures 22' wide by 2.5' high with perimeter PVC tape and corner ties. 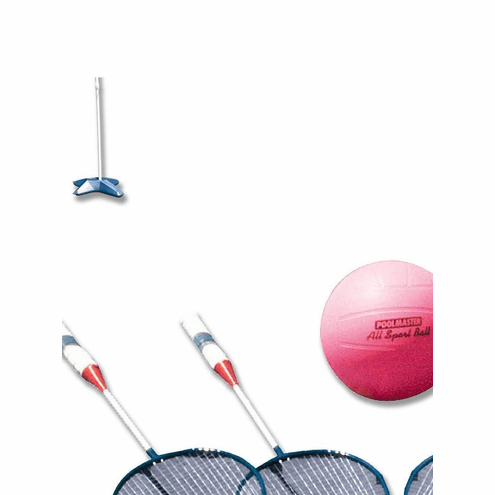 Includes deluxe water volleybal with inflating needle and a deluxe set of 4 metal badmintion rackets with 4 birds. Great fun for gatherings at picnics, swimming pool or at the beach.